Lightweight, unisex Virtua protective eyewear combines versatility, value and a comfortable, contoured fit. High wraparound coverage provides an unobstructed viewing range. 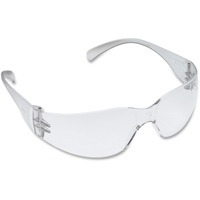 Virtua protective eyewear offers clear polycarbonate construction and an anti fog lens. Polycarbonate lens absorbs 99.9 percent ultraviolet rays. Eyewear meets the high impact requirements of ANSI Z87.1 2003.